According to the Gospel of John in the New Testament, Lazarus of Bethany was a man who died, but four days later as restored to life by Jesus. Although there is no further discussion of him within the Bible, both Roman Catholics and Eastern Orthodox Christians have traditions regarding his later life. According to Roman Catholics, he went to Provence in France and later became the first bishop of France. 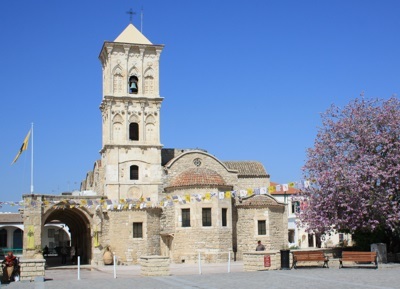 However, according to the Eastern Orthodox tradition, Lazarus went to Cyprus where he became the first bishop of Kition ( Larnaca, where he lived for the next thirty years before being buried for a second and final time. In 890, a tomb was found near Larnaca, which bore the inscription "Lazarus the friend of Christ". The Byzantine Emperor Leo VI had Lazarus' remains transferred to Constantinople, but had the Church of Saint Lazarus built over the tomb. A Gothic-style stone covered portico was added to the South side of the building during the Frankish or Venetian period (when the building was used by the Roman Catholic Church). There was originally three imposing domes as well as a bell tower. These were all destroyed early in the Ottoman period (possibly around 1571). The bell tower was rebuilt in 1857. A fire in 1970 damaged much of the interior including the iconostatis. Restoration work has however been subsequently done - and during these restoration works some human remains, part of Saint Lazarus' relics, were discovered.